Highly pathogenic avian influenza, like any disease spread primarily through human activities, is susceptible to biosecurity control measures along the production and marketing chain. It is this that makes biosecurity such an important tool for the control and eradication of H5N1 HPAI. And, because it is human-mediated, the focus must be on changing the behaviours of people in such a way that the risk of disease transmission is decreased. There is no technical barrier to biosecurity in theory, but its successful application requires understanding of the structure and problems of the poultry sector. 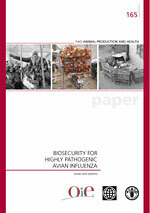 Biosecurity for Highly Pathogenic Avian Influenza: Issues and options aims to set biosecurity in the context of the field situation and to propose options for its improvement.